Honda Cars Philippines, Inc. (HCPI), Honda’s automobile unit in the Philippines, extends the chance for everyone to win this March with the final edition of “Everybody Wins” campaign. All customers who will inquire, test drive, reserve, or purchase a brand new Honda vehicle from March 1 to March 31, 2017 is entitled to a discount voucher of up to P 100,000. 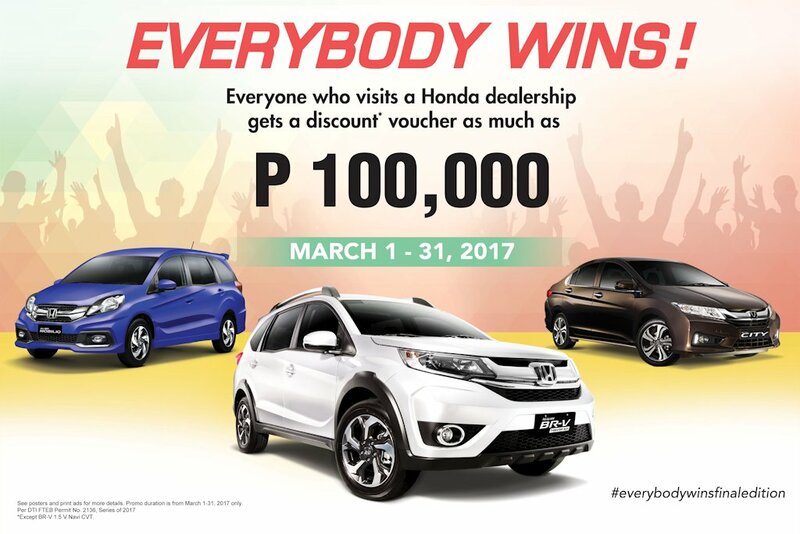 Customers may get their discount vouchers at the “Everybody Wins jar” located at the reception area of any Honda dealership. Each discount voucher consists of a corresponding discount worth up to P 100,000, which they can use when purchasing a Honda vehicle. Customers will only be entitled to one (1) coupon, which may be transferrable to another customer, and can only be redeemed until the end of the month. As an added treat this month, all existing Honda owners are entitled to an exclusive offer, on top of ongoing promotions, by visiting any Honda dealership nationwide. HCPI also invites everyone to SM Mall of Asia Atrium from today up to March 22, 2017, where Honda vehicles will be on display. Customers may check out Honda’s latest line-up, and get a chance to win complimentary tickets to Kidzania upon reservation.